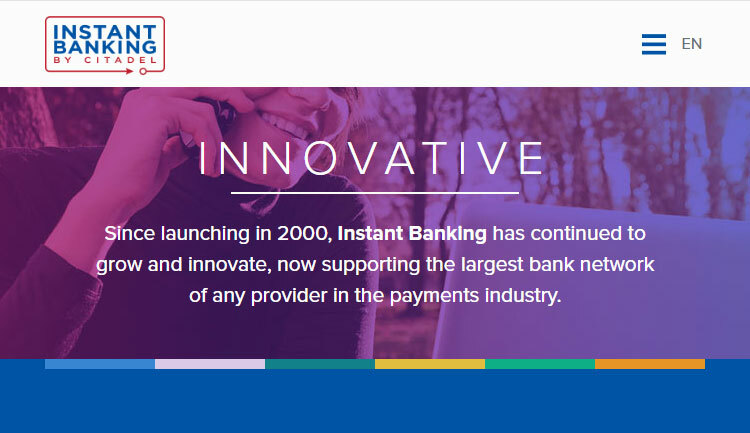 Citadel is a leading Canadian-based payment processing company, and their flagship service Instant Banking by Citadel is widely used as a payment method at online casinos worldwide. Launched in 2000 Citadel is a popular depositing method offering reliability and a secure and efficient means of transferring money. 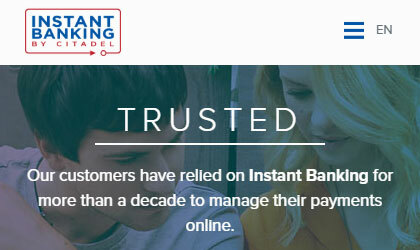 Instant Banking by Citadel allows you to make secure online payments directly from your bank account. Provided you have an account with a recognized Canadian bank you can transfer money directly to any of our online casinos accepting Citadel without the need to share any of your personal or financial information directly with the casino. Citadel acts a third-party agency, but unlike e-wallets like Neteller or Skrill there is no need to set up an Instant Banking account to use the service – all you need is an account at a financial institution that supports Citadel to make a payment. This means that using Citadel is quick, simple and efficient as there are no additional usernames or passwords to remember – to complete a transaction all you need is your internet banking log-in details. Once these steps have been completed your online casino receives confirmation that the transaction has been completed, and the funds will be available to play with immediately. The transferred funds will be debited from your bank account instantly, or at the latest the next working day). 3) The fact that you are not required to establish a separate Citadel account to make payments together with not having to share your personal banking details with the casino you play at means there are fewer third parties with access to your financial records. 4) Your anonymity is also protected as any transaction using Citadel appears on your bank statements as “Citadel Commerce”. 5) If your bank does not support Citadel instead of using the web-based version you can download a payment assistant app when you make your first Citadel transaction, this can then be used for all future payments with no need to re-install. 1) Although it is a widely-used, reputable and recognizable brand, Citadel is not universally accepted and the number of online casinos accepting Citadel is not as great as some other payment systems. 2) At some sites where Citadel can be used to make deposits, it’s not available as a withdrawal method. It’s always a good idea to confirm in advance before you make deposits at Citadel online casinos as to whether you can also withdraw your funds using this method too. 3) Consumers are given a limit the first time they make a payment using Citadel, the amount depending upon both the bank and casino, the limit will increase though as you accumulate a history of successful payments. Citadel offers a great payment solution for Canadian players seeking security and anonymity in their casino depositing activities but who don’t want to or haven’t got round to opening an e-wallet. Whilst not as widely accepted as a VISA casino or e-wallets there’s more than enough choice of online casinos offering Citadel instant banking as a depositing method.